Prominent & Leading Manufacturer from Surat, we offer aluminium glazing. Banking on our enriched industry experience, we are able to offer a wide gamut of aluminum glazing. Our company is highly acclaimed in offering a wide range of glazing. We design and fabricate this high grade quality glazing by employing finest grade basic materials. 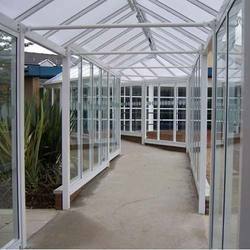 The entire glazing range is offered as per the prevailing standards of the industry. Thus, these are highly appreciated in the industry.